The Life Fitness Lifecycle GX Indoor Bike is a feature packed commercial cycle for commercial or home use and is top-rated. A high end bike with many features and solid quality. The GX has a heavy rear mounted flywheel which gives the experience of riding a real bike. Being rear mounted, protects the flywheel from sweat that could corrode metal parts. This is the same quality of bike used in Cycling Classes at the gym. The Life Lifecycle GX will provide an excellent cardiovascular workout with low impact on your joints. 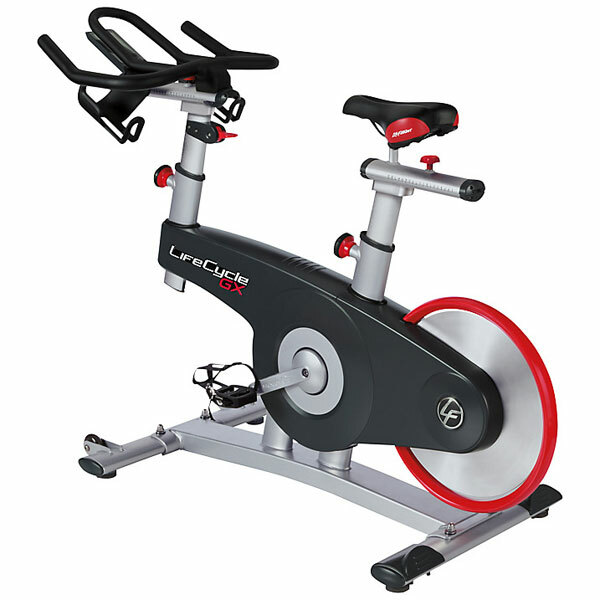 The Life Fitness Lifecycle GX features a heavy chrome plated flywheel, which creates a secure, quiet, vibration-free workout, and features adjustable magnetic resistance that simulates actual riding. This model is equipped with a belt drive system for a quiet ride with minimal maintenance. Unlike most indoor cycles, the Lifecycle GX has an electronically controlled magnetic resistance system (20 levels of resistance). Wireless Telemetry is enabled for Polar Heart straps to monitor heart rate. The padded seat is fully adjustable, as are the multi-position handlebars. The bike is constructed of Zinc oxide-coated steel, making it very solid while cycling (heavier bikes give a more stable ride). Other features: The LCD console (backlit) displays speed, distance, cadence, calories, time, heart rate, and resistance level. The Precision resistance brake lever allows for easy adjustments of resistance as you ride. The dual-sided SPD pedals offer alternatives for both soft and hard soled shoes. Dual water bottle holders. Bike Warranty: Frame(5 years); Mechanical Components (3 years); Saddle, Pedals, Console (1 year); Labor (90 days). Smart-Review Commentary: The Life Fitness Lifecycle GX indoor cycling bike is an excellent upright bike for home or commercial use. This is one of the only indoor commercial quality cycles we cover that has magnetic resistance. Most indoor cycles use friction resistance, and it must be manually applied. Magnetic resistance is silent, and requires no maintenance. The heavier weight of the Life Lifecycle GX makes it more stable than cheaper exercise bikes. It is our only indoor cycle that has a 45 pound, rear mounted flywheel which makes the ride very smooth, and protects it from sweat. This model should fit most needs as its maximum user weight is 300 lbs. The heavy frame is built for added stability, and coated in zinc to prevent corrosion. Toe straps are included. The Life Lifecycle GX as a commercial bike is exactly like the bikes you would see at a commercial gym. 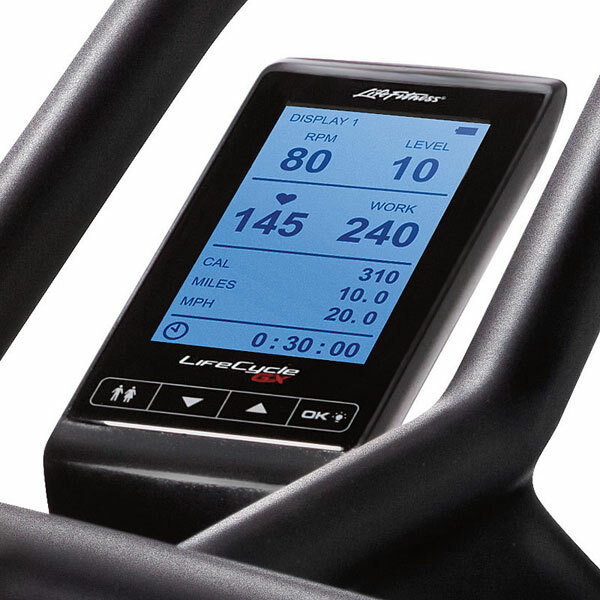 Most indoor cycles do not have magnetic resistance, The LifeCycle GX has 20 levels of magnetic resistance. The easy to use lever changes resistance, and the level shows up on the LCD console. The Life Lifecycle GX bike has an excellent warranty for an indoor cycle. This type of bike is also ideal for outdoor cyclists to train indoors. Life provides a padded seat that is adjustable for added comfort, and options to get a wider seat. This Bike has received extremely high professional and consumer reviews. The Life Fitness Lifecycle GX is a Smart-Review Top Pick for exercise bikes in 2018 and has received our BEST of 2018 Award.